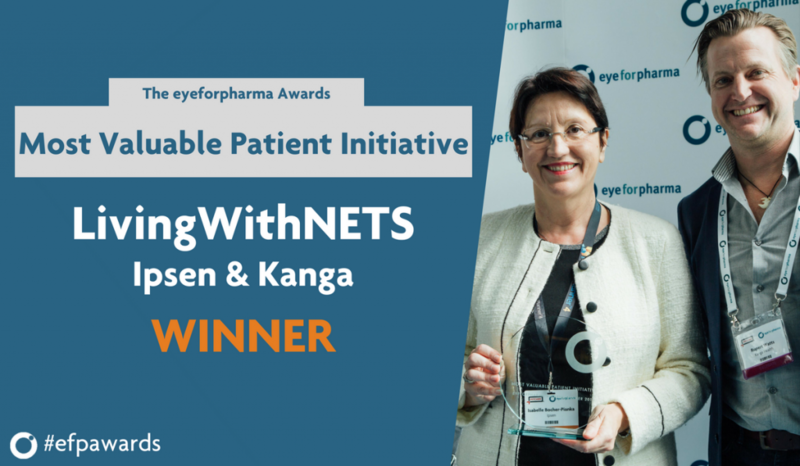 LivingwithNETs wins ‘Most Valuable Patient Initiative’ at eyeforpharma awards! One of Kanga's projects has won an award at the annual eyeforpharma conference in Barcelona! LivingwithNETs.com is a website developed with Ipsen in collaboration with patients and healthcare professionals. It won the ‘Most Valuable Patient Initiative’ – an award that recognises projects that demonstrate real understanding for the patient requirements prior to implementation and have a significant positive impact on the patient’s life. The project was a finalist along with several other strong patient initatives in the annual eyeforpharma Europe awards. Keep following our Twitter account for more news on awards.